Imaani | Hand paint your IMAANI wedding shoes after the big day! Hand paint your IMAANI wedding shoes after the big day! 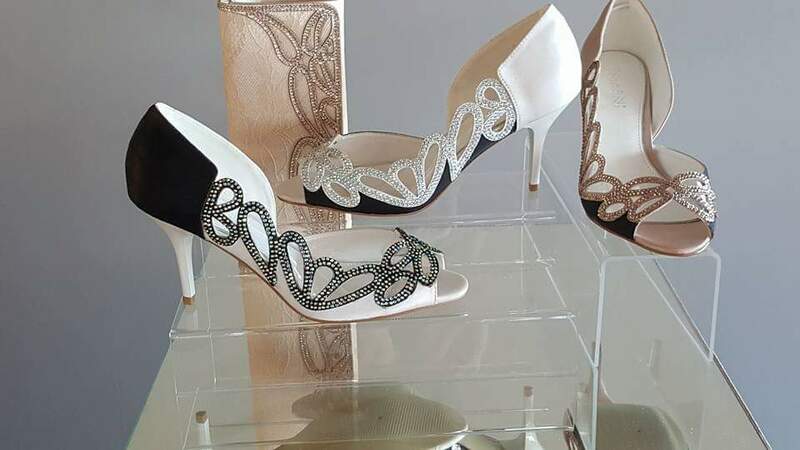 I would like to share a little trade secret with you: Did you know that you can hand-paint your Satin IMAANI wedding shoes after your big day, to create a whole new look? You can create a masterpiece by following these simple steps and it won’t cost you much either. Mix the water and detergent in a bowl, then dip the soft side of the sponge into your cleaning mixture and wipe any dirt from the insole, the heel and the upper material of your shoes. Then use the rough side of your sponge to clean off any dirt from the outsole of your shoes. Once your shoes are clean, wipe away any excess water using a clean dry towel. Leave your shoes to dry completely at room temperature - not near heat and not in direct sunlight. Once your shoes are clean and dry, you’re ready for the artistic makeover! STEP TWO: Decide what you want to do to your shoe and which colour you would like to use to create the new look. I use Dala fabric paint which cost R30 for 50ml’s at my local arts and craft shop. There are various colours available like black, navy, cyan blue, santa red, cerise, maroon, navy as well as metalic shades like silver and copper. I also bought various size paint brushes like a broader brush for the bigger surfaces and sharper smaller brushes to get into the corners or for finer details and the brushes cost me about R20 per brush. You should also have with you a cup of clean water for dipping your paint brushes in as well as a clean cloth that you can use to wipe off any paint where you go over edges. STEP 3: Are you ready to play, Picasso? Start off by carefully painting around the edges and in the sharp corners, using your sharp brush. Be very careful not to go over fabric that you don’t want to paint. If you accidentally get paint onto the lining or outsole, wipe it off with the cloth while the paint is wet. For the bigger surfaces, use your bigger paint brush, painting in one direction. You can apply the colour paint more than once to create a deeper colour. You can also paint the panels where your cristal trims are, by painting over the trims. Once the shoes are dry, take a damp cloth and wipe the paint off your trims to bring back the bling and shimmer of your trims. If the heel of your shoe is covered with Satin, you can paint your heels too, but if your shoes have resin plastic heels, leave them as is, because the Dala paint won’t be effective to change the colour of your resin heels. STEP 4: Once your masterpiece is finished and you’re happy with the depth of the colour, use a hairdryer to set the colour by blowing direct onto the painted areas with your heat setting on maximum. Once your shoes are dry, you can give the trims one more wipe down to ensure they shimmer beautifully. 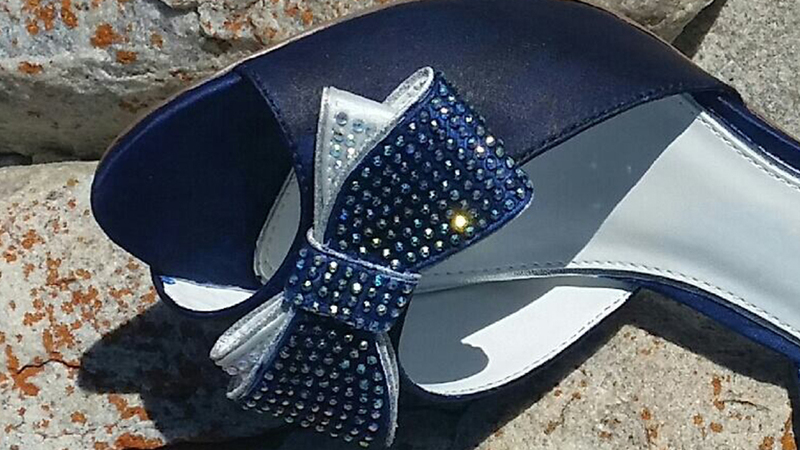 I have found that the satin shoes are the best to paint and alter, so I recommend that you use the following IMAANI styles for this project: Shani, Zuri, Malaika, Eshe. Painting over lace won’t give the same effect as it doesn’t shine as beautifully as satin. Take BEFORE AND AFTER PICTURES of your masterpiece and share it with us, to feature on our social media platforms, by tagging Imaani. Remember to plan well and more importantly, HAVE FUN!